Probably originating in the west coast of Africa, rice and peas is an extremely popular staple throughout the Caribbean. If you have never had this before, you are in for a treat! In the lilting patois of the islands, 'peas' has been adopted as the name for all dried and fresh legumes - including what we call 'beans'. 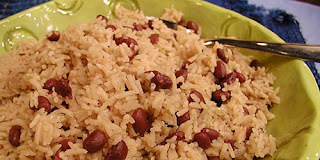 The 'peas' can be kidney beans, black-eye beans, gunga peas (pigeon peas) or any similar legume. It's usually served as an accompaniment to curries and other spicy fare, where its relative blandness is used to balance the piquancy of the meat. Heat the oil in a heavy saucepan with a tight-fitting lid until hot and add the onions. Stir and fry until the onions begin to caramelise. Add the dry rice and allow it to become coated in the oil and onion mixture. Add all remaining ingredients and stir. Cover tightly and bring to a rapid rolling boil. Reduce to a low simmer for 3 minutes then turn the heat off. Rest the rice, covered for 10 minutes to absorb all the liquid and cook in the retiring heat of the pot. DO NOT REMOVE THE LID! Removing the lid will allow the steam to escape and the rice will not cook. The rice will keep hot for quite a long time if left covered. Serve alongside jerked meat, curries and ackees and salt codfish.